Welcome to the first post of the first series to hit the blog!! I’ve been wanting to bring a series to the blog now for awhile, but couldn’t find one that stuck. That fit my personality or peaked my interest enough to write about it on a regular basis. There was Wedding Wednesday, Foodie Friday, Throwback Thursday . . . blah . . . blah . . . blah . . . Some people pull these off and they’re FABULOUS at it – hats of to you. But you can tell they’re passionate about their topics. For me it took some time. I tried for weeks to drum up ideas and nothing. Until yesterday. The idea was originally 100 Days of Christmas, but I was a little too late for that one this year. BUT instead of getting discouraged I simply shortened it and got UBER EXCITED. Yes I just said uber. Yes I know how dated that was. No, I don’t care. Here is the first of 75 posts you’ll see relating to Christmas. Yes, I know there’s only 63 days until Christmas. But I’m encompassing the ENTIRE Christmas holiday right up to OLD Christmas Day. I’ll cover everything from holiday budgets, decor, DIY projects, snacks and holiday recipes, fun activities and traditions; gift ideas, etc. If you can think of it, I’ll be covering it. First up is Christmas/holiday budgets. We’re busy people and time gets away from us. Before you know it that dreadful Christmas countdown is on the radio reminding you of your limited shopping days. Or maybe you’re like the many who start buying early; only to pull out the old tickle trunk to start wrapping to find you have a dozen presents for one person, but nothing for two others. If this design isn’t quite offer what you’re looking for, ‘I’m an Organizing Junkie (and you can be too! )’ offers several different designs and packages for FREE, right here! 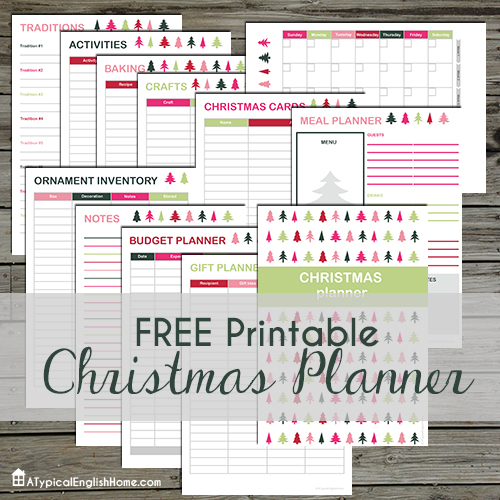 They’re all free printables and are a GOD SENT for those of us who need a little help keeping things straight. Head on over and check them out!